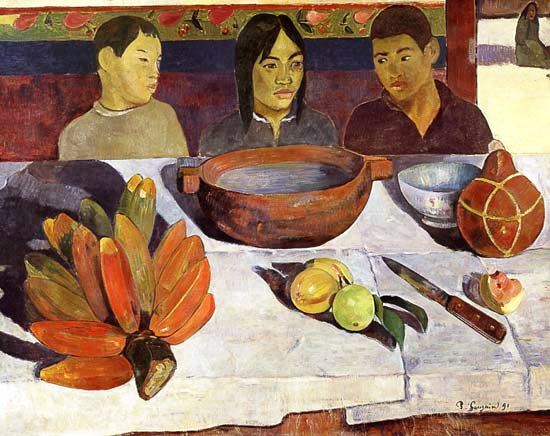 Posted on May 13, 2012, in Magpie Tales, Poetry, Sunday Scribblings and tagged also called, Bananas, clabash, dishware-and-cutlery, fruits-and-vegetables, impressionism, in the beginning, life in Tahiti, Magpie Tales, mealtimes, Musée d'Orsay, Paul Gauguin, poetry prompt, post-impressionism, sunday scribblings, The Meal, vermillion, writing prompt. Bookmark the permalink. 31 Comments. The rhythm flows into an enjoyable read. Love this one! like others, I often don’t look close enough to really see the essence of a painting, real or not real. Thanks for creating that awareness. They say that Gauguins’s style of painting was supposed to convey the feelings of the subject…your interpretation is spot on!! Captured every inch of the painting I will say, except may a small spot in the corner, you might have missed that..lol…great verse. You really delved into this and, it shows. Flowed really well and told a story too. Nice one Bat-Ami. “scene contrived, a meal that’s fake too much fruit” … What an insightful thought. Fruits galore can be ideal against the flabby girth in modern times. The kids looked glum though. Your verse is hilarious Tammy! Your images are bold, and your writing leaves a solid picture….clearly they should find the figs! Great writing! Something Witchy this way comes ! . Nothing escaped you..I’ll follow you anywhere!! So very well captured with terrific flow and insight. I really enjoyed the rhythm and rhyme of your poem … great job. This take really appeals. It grabbed me from the first. Very cute! They do have a very disgruntled look. I did not notice the mother until I read this, and even missed her while reading Helen’s contribution. But maybe that is the key to understanding the image of three young people and why the kava bowl is so prominent. But all that aside, the poem flowed and captured the impressionist feeling well. Love it! “Too much fruit, a belly ache” was my favourite line amongst many. oh the painting got its meaning fully..you made it more vivid….